Twice Central Guesthouse is running a promotion from 10 October – 5 December 2018. Winners must transport themselves to and from Twice Central Guesthouse and no airfare costs will be covered should the winner not be from Western Cape. 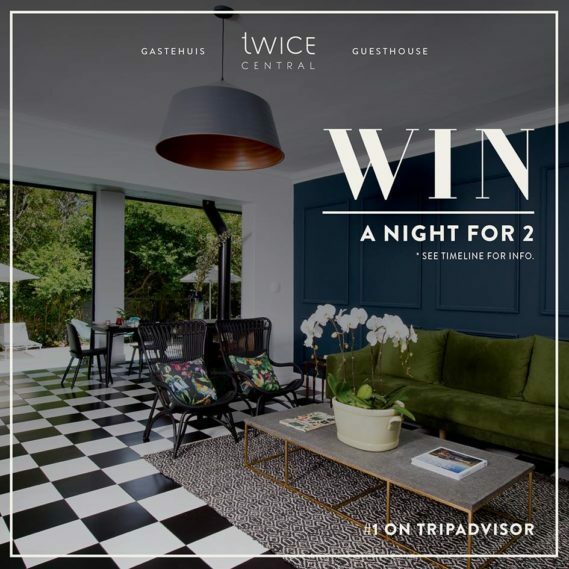 Twice Central Guesthouse retains the right to publicise the winner’s name and photos across all marketing material and platforms. Family members of the staff working at Twice Central Guesthouse may not partake in the competition. Twice Central Guesthouse management reserves the right to amend or withdraw the promotion in the event of any unforeseen circumstances outside their reasonable control. Twice Central Guesthouse management reserves the right to announce another winner should the original winner not be reached when contacted telephonically. This promotion is in no way sponsored, endorsed or administered by, or associated with, Facebook. You are providing your information to Twice Central Guesthouse and not to Facebook. The information you provide will only be used for e-mail marketing purposes and not shared with any third parties.